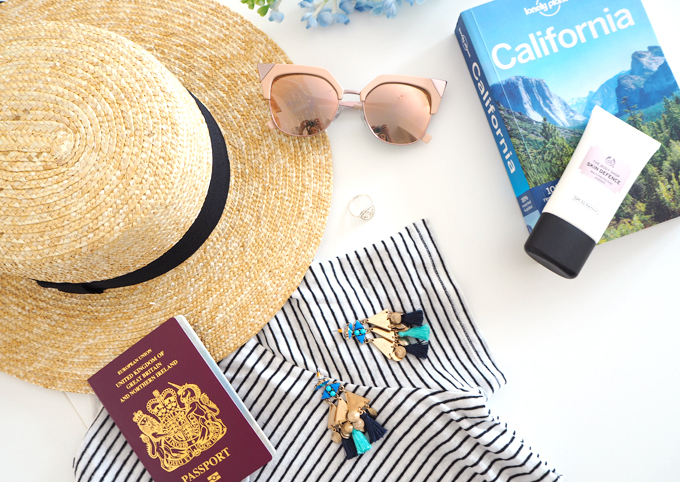 It’s not long now until I jet off to sunny California on an American roadtrip of a lifetime, so I thought I would share some of my holiday essentials I’ll be packing in my suitcase this year. 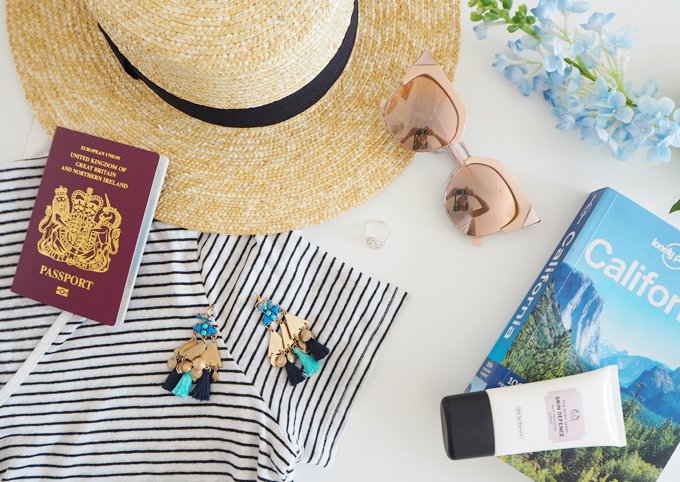 This trip is all about adventure and discovering somewhere new so I need to pack with comfort, ease and convenience in mind. Most of the clothes I’ll be packing are laid back and casual to fit in with the LA lifestyle, lots of loose fitting tees, high waisted shorts and flowing dresses. As my outfits are pretty simple I wanted to take some key accessories to add a little colour and interest. I love this flat fedora hat I found in M&S, not only will it look super chic styled with a simple striped tee but will provide some much needed shade from the famous California sun. These statement earrings from Happiness Boutique are one of my favourite accessories recently, I love how they can take a basic swing dress from day to night instantly. 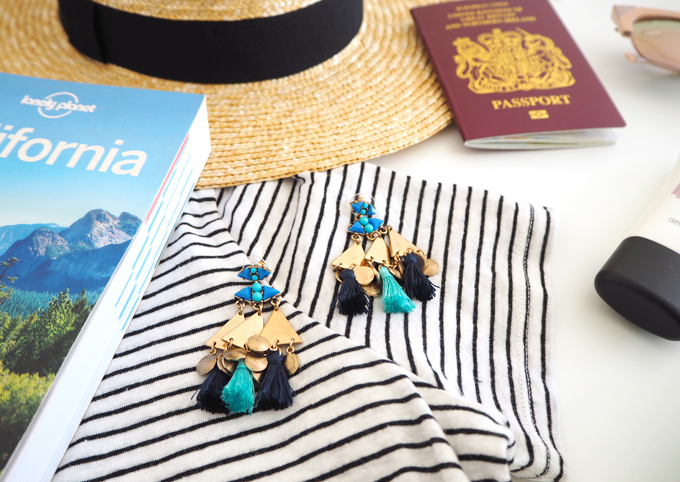 For such a small accessory, they make a big difference when you need to get the most out of your suitcase. When it comes to protecting myself from the sun, I had been looking for a good SPF for a while, then I recently stumbled across the new Skin Defence range from The Body Shop. 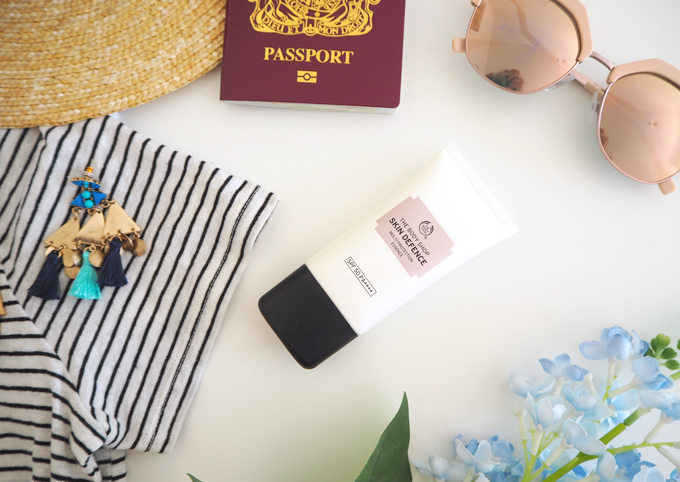 This facial sun cream offers really high protection without the sticky, shiny finish. It will be perfect to apply as a base under my makeup before heading out for a day of exploring. 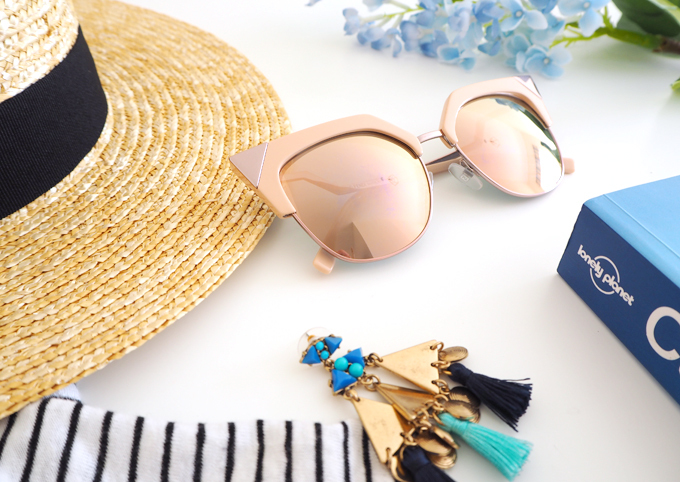 I have always been a big fan of sunglasses and this year I can’t wait to wear these gorgeous, retro style Fendi ones from SmartBuyGlasses. 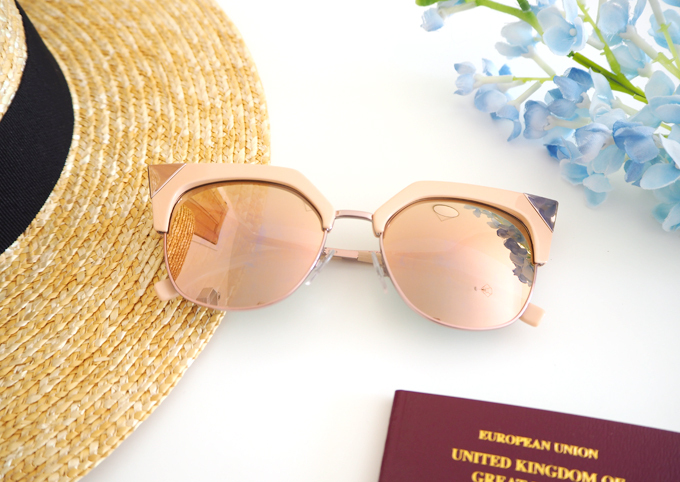 Rose gold and blush is still one of my favourite colour combinations, I find it really easy to wear as it goes with multiple outfits and styles, making these sunglasses the perfect accessory for our trip to California. If like me you love designer glasses but don’t want a big price tag, check out SmartBuyGlasses.com as they offer hundreds of styles from designers such as RayBan, Fendi and Gucci at discounted prices. Follow my travels on Instagram to see me wearing these sunnies throughout our trip around LA, San Fran and Vegas. As we will be moving around a lots during our trip, I wanted to keep myself entertained whilst catching buses and planes, so thought I would download some audio books to listen too. I think they are such a great idea for long journeys where you don’t want to be reading or concentrating all the time. One of the days in San Fran we have planned to travel to Yosemite National Park via bus and although I want to keep myself entertained I also don’t want to miss any of the scenery whilst driving there, so audio book would be perfect. I am thinking some self help or inspirational life books would be right up my street so please let me know your recommendations for e-books to listen too in the comments below, I would love to hear about ones you have loved! Lastly I couldn’t travel to Cali without my faithful Olympus Pen camera. It is my top essential accessory this summer as I can’t wait to document my travels and share it with you guys. Recently I have been getting used to taking my camera off auto mode thanks to a really useful WeBlogMCR workshop, and am hoping to put my skills into action whilst I am there. I want to get lots of travel post up when I am back, as well as some cool vlogs about our stay in each city, so keep your eyes peeled. What are your top holiday essentials this year?